Overnight accommodation in Corsica? Campsite, villa or Bed and Breakfast? Book a B&B in Corsica and wake up to splendid natural surroundings! You've decided to take a Corsican B&B holiday, but haven’t yet found the right accommodation for you? 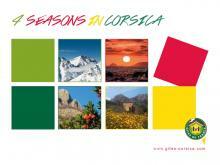 Then take a look at our superb choice of Corsican B&B accommodations at the most affordable prices! Our network of selected homes assures you the friendliest welcomes in the most comfortable surroundings, whether for overnight or longer stays. Authenticity, conviviality, natural surroundings, relaxation, amazingly beautiful countryside and the joys of the great outdoors, all can be yours when you opt for a B&B in Corsica with Gites Corsica! In addition to a wide range of great value Corsican B&B accommodations, Gites Corsica also offers holidays in apartments, villas, gites and campsites in Corsica. Whether in Calvi, Bonifacio, Ajaccio, Bastia, or one of Corsica’s lesser-known destinations, the choice is yours.